The January transfer window closed in Scotland at 00:00 GMT, with all the deadline day moves listed below. Celtic have recruited Turkey striker Colin Kazim-Richards from Feyenoord and confirmed the addition of Manchester City teenager Patrick Roberts on loan. The Scottish champions have also sent Nadir Ciftci to Super Lig club Eskisehirspor on loan. Aberdeen have brought in Wales striker Simon Church from MK Dons, allowing David Goodwillie to join Ross County. Hearts ended a very busy day by signing defender John Souttar from Dundee United, following the additions of striker Abiola Dauda and midfielder Don Cowie. Morgaro Gomis departs Tynecastle on loan, joining Premiership rivals Motherwell, while a deal has been agreed to sell top-scorer Osman Sow to a Chinese club, where the window runs on for longer. Partick Thistle have signed former Gillingham forward Antonio German on a deal until the end of the season and Celtic teenager Aidan Nesbitt is moving to Firhill on loan. Kilmarnock may not have a manager but that has not stopped midfielder Gary Dicker leaving Carlisle to sign an 18-month contract at Rugby Park. He is joined on loan by MK Dons full-back Lee Hodson. Inverness CT were chasing a striker but signed two midfielders. Ryan Williams joins from Brentford while Liam Hughes has completed a move from Cambridge following a successful trial. 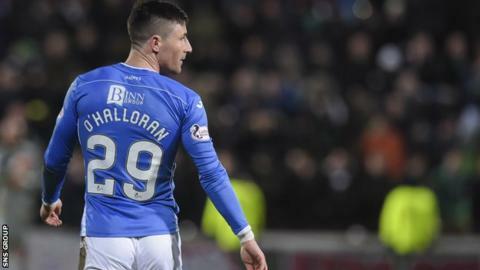 Championship leaders Rangers have signed forward Michael O'Halloran from St Johnstone for an undisclosed fee.